One thing I would like to mention, you dont have to spend a lot of money on things you dont need in many cases. A parallel is a set of steel bars of the same thickness and width used in a vise to hold things in a manner so it is straight and square. But not resting on the bottom. This way you can drill a hole and not drill or mill into your milling table vise or whatever. There are already many items out there to buy to do this. The aluminum I used is an example. It is very accurate and square more than enough for most jobs. You can also use them to set up flat stock in the head of a lathe to get it to sit square. Just remember to pull them out before to start the lathe or you will be sorry. I felt something strange when I moved the cross slide so I took it off for adjustments and cleaning. The strange was an ever so subtle tight spot in the travel back and forth. The long skinny thing you see in the2nd picture is the gib, it is tapered. It is used to adjust the slop in the dove tails. The brass nut thing on the threaded rod is also an adjustment for backlash. Once everything was cleaned up and put back together the strange spot disappeared. Took all of about fifteen minutes. I keep my backlash around .007 no premature wear from being over tight and it never gets worse. The other picture is the other half of the cross slide upside down. The copper thing sticking up is what I replaced the carriage lock down screw with. I got tired of looking for the wrench to fit the other one so now I can stick just about anything in the hole to turn it. It was made from an electrical grounding rod. Copper on the outside and steel in the middle. Last edited by Worth1; March 16, 2019 at 12:29 PM. I'll make the commentary and then show pictures. I friend of mine had a machinist making grooved pipe for him and he is older and retiring. He asked me some time ago if I wanted t sell mine, 'well you know what the answer was for that. He makes huge commercial RO systems. Well today he came over and said he wanted to look at my late so sure. Then he told me he bought one. So we went out to his place and looked at it. Mind you he doesn't know one thing about running a lathe or how to even hardly get it to go. But the guy that did his work for him gave 1 hour class. He was trying to cut grooves in pipe to no avail so I fired it up and showed him all the stuff he as doig wrong. The poor guy had no idea at all. The cutting tool was about 1/4 inch off center so you get the idea. He was cutting way to slow too. I spun the puppy up to about 450 and cut a pretty good groove even though stock was hanging out way too far. He was shown the down and dirty razor blade trick to get the tool on center. I showed him several other things it did and explained it to him. I told him to get a bull nose live center to hold the end rigid and explained rigidity while cutting. In the pictures coming soon you will see the lathe (((after))) it was cleaned. To be honest I told him the lathe was in really good shape for as old as it is and hardly no wear in the ways at all. So that is how I spent my Sunday afternoon, showing someone my age how to run a lathe. I had the time of my life running this old thing from our past and figuring out what all the levers did. I will also be picking up some work from him that he cant do hopefully. I told him he got a very good deal on the lathe considering what he needed it for. Pipe grooving machines are way more expensive than what he paid for the lathe. I volunteered to give it some tender loving care and adjustments as the old gal deserves it. One of the last of good old American Iron. They will never make this stuff again. Ordered a dial caliper last night. Noticed LS Starrett had a cheaper one for $120 it is imported. Didn't buy it as you can get them cheaper than that. I was wondering when they were going to go overseas. The U.S. made ones are twice the price. Back in the '80's I was in the Industrial Supply Business and Starrett was a "franchised" line. It was a license to print money. Then Mitutoyo came in the scene. I have several Starrett measuring instruments. Rest assured I paid around 1/4 of the new price after much bartering. All of the stuff I ordered came in yesterday. For those that are interested I will show the use of each one in due time. The one I really wanted and finally got is the ACME 29° screw thread tool gauge AKA center gauge and ACME thread pitch gauge. It is almost impossible to grind an ACME thread cutting tool without one. Not impossible but darn hard. The other item I really needed is a set of Pee Dee thread measuring wires. You use these to measuer threads you are cutting to know when to stop cutting and the threads are correct. Sort of complected and you need a third hand. Used to grind an ACME thread form tool. Small flat is ground and measured by way of slots on edge of gauge. Here it is ground for 10 threads per inch. A little hand honing and it is good to go. Tool bit is 5% cobalt high speed steel 3/16th. ACME threads are used for making things move and clamping. 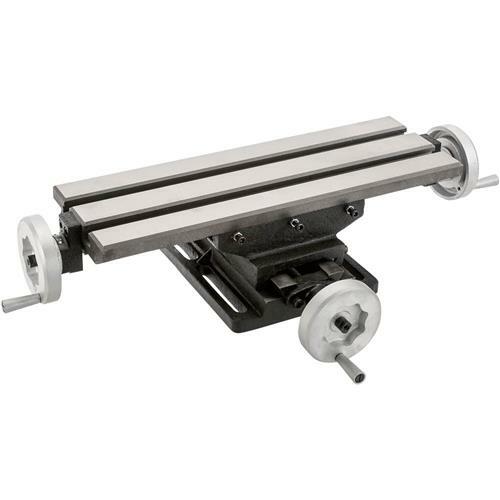 Like the rod on your garage door opener C clamps lead screws on lathes and milling machines. Acme threads cut with new tool and example of Acme thread pitch guage in use indicating 10 threads per inch correct. Here is the set down to one thread per inch. The machine to cut one thread per inch would be massive. Just ordered this compound slide X Y table for the drill press a much needed item before if I ever I get a milling machine. Been putting it off for awhile and it was on sale. Going to use it to locate holes and so on. I am sick and tired of fumbling around tapping material around on the drill press to do it. Using up time I dont have. Read several reviews on the table. Everything from junk to the best thing ever. The complaints were the usual ones and I ignored them. The more knowledgeable people liked it after some adjustment and working on. Most of this cheaper stuff needs a little finishing and so on. What ever the case may be I have everything to make it the best it can be.